I am a Game Designer and Pixel Artist who has been making sprites for video games professionally for more than 10 years. One of the most difficult things to do when putting a game together is good quality source art work, and in particular sprites complete with animations. Most designers/programmers/beginners just need something that works, and this is my bid to provide a growing archive of useful sprites you can drop into any game. I want to make sprite sheets that are easy to adapt for use in any project, by providing black and white templates with multiple shading styles. Not only are these easy to use, but you can swap them out for your own colors and style! 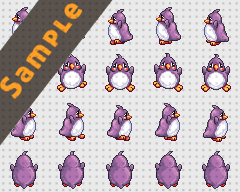 Many artists offer sprite sheets for commission, but I want to offer ones you can build on and will actually want to use in your own projects. By gaining your support through Patreon, I will be able to do this on a regular basis. 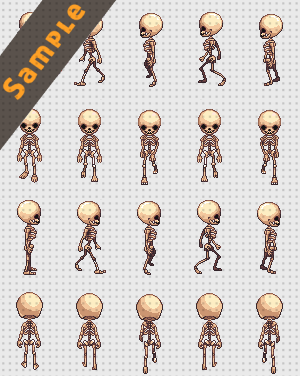 All of the sprites you pledge for you can use for your own personal use. If you would like to use them commercially, all I ask is that you at some point make a 25$ pledge (one time) and you get full commercial usage for any and all sprites you get from me past and future! If money is tight don't worry, you can pay it when you've released /are ready to release your game! I understand what it's like to be a small/first time game developer which is why I wanted to create an affordable, expandable asset library. Our Thanks for Becoming a Patron! You will be able to submit suggestions and vote on what my next spritesheet will be ! Make Suggestions On The Next Pack! A colorized doodle especially for you every month! Personalized doodle or watercolor in the mail! You can use any of the sprite sheets you've gained from being a patron for commercial projects. You only need to pledge this one time to have commercial access to all of the sheets you've gained via being a patron and you can upgrade to this at any time. I will give you pointers on up to 2 art pieces a month. Get a 4 frame sprite prototype every month at this tier. You can add on to your prototype each successive month (4 frames each month) or get a new one! I will also be willing to animate it all in one go for an extra fee. I will design a simple character for you to use as your brand for your game, company, store, etc. I will design a 2D Facerig avatar especially for your own personal use. I currently have the free version of Live2D so keep in mind it will have to be simple.